Last week we did a post about the new Convergence DVDs, describing them as very, very thoughtful and interesting: three DVDs of Donald Miller interviewing Phyllis Tickle, Lauren Winner and the always impressive Dan Allander/Tremper Longman tag-team. Of course for our exceptional literary types, I sort of apologized, and mentioned that those who care about the printed page might want to also be excited about the new Wendell Berry volume of poetry, Leavings. So it goes; Hearts & Minds, trying to reach various sorts of customers, different, yet united by their hope of finding faith-based stuff that is a bit better than much of what one finds out there. We love old-school, rural, literary types like Wendell Berry (and have a brand new book about him, too, which we’ll review soon) and we have the most contemporary releases of DVDs and audios and such. CD A Million Miles in a Thousand Days: What I Learned While Editing My Life Donald Miller $24.99 You may have read my review of this great new book in an earlier column. We love it and think it deserves to be read, given out, discussed widely. It is an excellent book for anybody trying to figure out their life, yearning for some story to live in and out of, some way to see a trajectory that is going in some purposeful direction. It is a bit self-deprecating, honest, only a little snarky, and very, very funny. And yes, the CD audio book is being read by Mr. Miller, making it great for one on the go. FREE BOOK OFFER: Buy this audio (or the regular hardback book) and we will give you a gift book version of Blue Like Jazz absolutely free. Called Jazz Notes this small full color hardback has not only handsome moody color photos but a CD tipped in the back that has Miller reading excerpts of the book in his best bohemian voice, spoken over and around some fairly average soft jazz. It’s a pretty cool way to introduce a friend to Donald Miller — to hear him reading. And we are sending it free with any Million Miles… book or audio purchase.Yay. 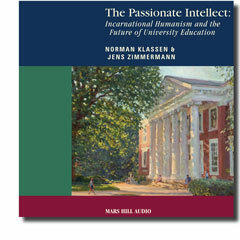 CD The Passionate Intellect: Incarnational Humanism and the Future of University Education Norman Klassen & Jens Zimmerman (Mars Hill Audio) $24.99 Anything narrated by Ken Myers is worth listening to. It is a given that if he selects it to put into an audiobook, it is well worth hearing. We loved this book about the meaning of education and true humanness, so when we heard Mars Hill Audio was producing an unabridged reading, we were jazzed. Rich, classy, provocative, and solid…we are happy to stock this Mars Hill audio book. If you don’t know the Mars Hill audio journal subscription, we highly recommend it. Visit their very thoughtful website home at www.marshillaudio.org. CD Are Christians Human? An Exploration of True Spirituality Nigel Cameron (Mars Hill Audio) $20.00 Although we have a few in stock, the paperback book version of this excellent study is out of print. When the perceptive Mr. Myers realized this was no longer around, he thought it should be made available again, and selected it to record. It is a book that can be listened to profitably over and over. Dr. Cameron is a theologian and medical ethicist, rooting his thoughtful and prophetic insight about the nature of spirituality in a proper understanding of the human person. He rejects Platonic dualism, and affirms the nature of humans as embodied in a good creation. It is an exceptionally rich account of mature spirituality which at once provides a Biblical alternative to sloppy gnostic nonsense of the liberal sort, and hyper-pietism of the fundamentalist sort. Read by Ken Myers. CD The Church in Joyous Obedience Walter Brueggemann (Regent College ) $30.00 The graceful package artwork by Sandra Bowden is the first gentle hint that this is truly an extraordinary product. Dr. Brueggemann spent several days in British Columbia at the 2008 Laing Lectures hosted at the renowned evangelical grad school where he gave some of the most stunning presentations I have heard from him. He lectured on Torah, on Isaiah, and on Jeremiah–standard fare stuff for those who know his body of work. Yet, the poetic passion and imaginative connections he makes in these three lectures are exceptionally brilliant and stimulating. After each lecture, two Regent profs (one a Biblical scholar and the other an economist) give responses, raising some questions they had for the good preacher, and he briefly responds. What a great example of gracious and serious conversation. We think it is the kind of thing H&M fans would appreciate and we eagerly recommend it. This does demand a lot of RAM and at least 18GB of free hard disk space, and obviously a good video card, a DVD-ROM drive, etc. 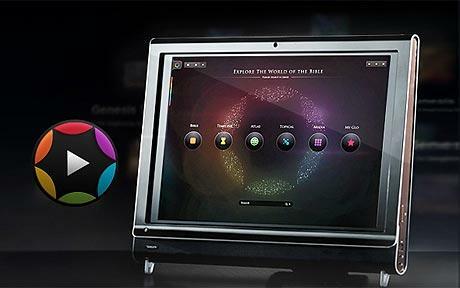 If you are interested in ordering this amazing item from us, check here first for PC System Requirements. The audio version of Donald Miller’s A Million Miles is awesome. He recorded it while he was still editing the material, so it contains entire sections and a whole chapter that ended up getting cut from the print version of the book. I wanted to invite you to a webinar hosted by Donald Miller next Thursday morning on the subject of his new â€œConvergenceâ€ DVDs for small groups (mostly). Convergence is Miller at his best: doing honest talk about faith. On the first dvd set he talks to Dan Allender, Phyllis Tickle, Lauren Winner. He just recorded the next set with Randy Alcorn, Henry Cloud, John Townsend. You can listen in Thursday, Dec. 17 at (11 am PT, 12 pm MT, 1 pm CT, 2 pm ET). Go to https://www1.gotomeeting.com/register/543081489 to RSVP for the webinar & we’ll be sure to send you a reminder. You can learn more about Convergence at http://www.allthingsconverge.com. If you have any further questions please feel free to email Monique@Lovell- Fairchild.com.